So many of the condiments sold in stores, are often quick and easy to make at home. It’s also less expensive, you know exactly what’s in them and most importantly, they taste so much better! Pickled jalapeños are a favorite in our household, and I’ve been making them for many years. Once you have the ingredients lined up, the process doesn’t take more than 30 minutes start to finish! 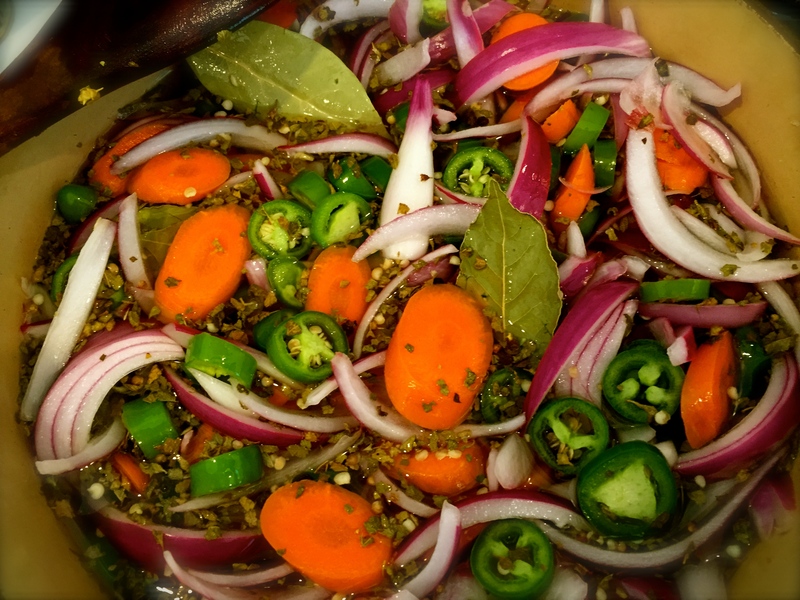 We really enjoy the addition of sliced carrots and red onions mixed in with the jalapeños. If you aren’t fond of hot food, remove the seeds and the white membranes when you slice the chile peppers. Also, you might want to wear gloves if you have sensitive skin. If you don’t wear gloves, remember to not touch your eyes or they will get irritated. Combine and mix everything in a non-reactive pot. Bring to a boil. Turn off the heat, and let it cool. Pack the veggies tightly into glass jars and cover with the brine. Close with lids and refrigerate. These pickles should last for at least a couple of months. The recipe yields about 4 pints. We eat some, and give some away to friends. They are great with tacos, burritos and cilantro potatoes, with nachos and anything else in need of a little kick! ay yai yai ! muy sabroso, corazón! This sounds really good, I’m going to try it. Spicy! That’s how I like it. Thanks Marlene! We ate a bunch yesterday with a Mexican style dinner. This looks awesome. Thanks for sharing how easy it can be. I’ve never pickled before. I’ve been doing all kinds of condiments and really like doing it. Tasty and healthier than the canned stuff. These were so yummy. Of course I only got a bite. Dan ate everything else! Thanks! We have almost eaten our way through the jar, time to make more soon! Thanks! I always make extra to send home with friends. Everyone seems to like them. They are! Try them, you won’t be sorry! Thanks for stopping by.